Hi, I'm Stijn Stroobants and I'm employeed as a Drupal developer at Dropsolid nv. My passion for web-development started about 15 years ago by building some fancy, responsive, static HTML-websites. I can say that webdevelopment is a passion. I started using CMS with WordPress and Joomla. But after a while I realized these Open Source CMS cannot fill my needs. 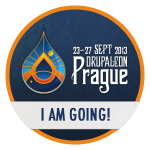 After looking for alternatives I came out to Drupal. Since 2012 I started using Drupal 7 and get employeed at Dropsolid, who gave me all the necessary trainings to become a great developer.